I LOVE stained glass. I was in love with my Edwardian house before I even got through the door due to the handsome original stained glass window over the front door. But who has the patience, time, money and know-how to commission an artist to due a bespoke piece for their house? Let alone figure out how to install it properly? Well the Dutch have the answer. As a result of meeting W, my Dutch other half, I have been to Holland several times and they have an easy and simple way to display stained glass in any window. So next time you see a piece at a gallery/craft fair/junk shop/reclamation yard you may be able to find a space for it in your home by going Dutch. I acquired this lovely piece of framed stained glass on a trip to Cannon Beach, Oregon and schlepped it all the way back to Manchester, UK in one piece. After considering various windows in the house I decided it would look best in the stairwell window, which once upon a time in the 1930s may actually have been stained glass. Using a white small metal curtain rod and two brackets scavenged from an old wardrobe W hung a the rod at the very top of the window. We attached two hooks to gold chain (nothing fancy, this was straight from the hardware store stuff) and attached them to the rod. Then we used two more hooks screwed into the wooden frame of the stained glass and hung these from the chain, voila swanky stained glass in the window! 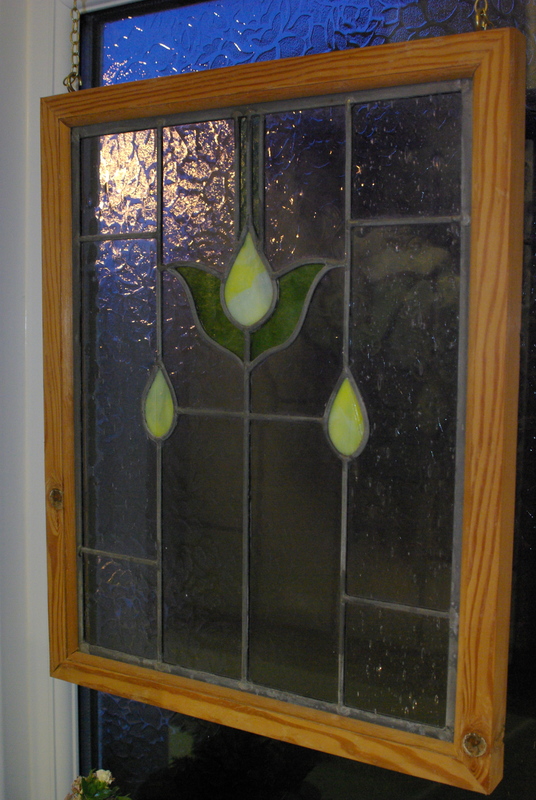 Gorgeous – I love stained glass too and this is a great way of getting it without having to replace all the windows! The dutch, they a clever people. This entry was posted on January 26, 2014 by The Sourcerist in Projects and tagged Dutch, stained glass, zerotohero.